Find out more about their fourth studio album and when you can see the All My Friends outfit this year. LCD Soundsystem have announced their first album in seven years. American Dream will be the follow-up to 2010's This Is Happening, and will be released by the electronic outfit on 2 September this year. The record from James Murphy and co. will include the album title track and Call The Police, plus new songs Emotional Haircut, Change Yr Mind and Other Voices. The All My Friends hitmakers have also announced tour dates which includes shows at The Warehouse Project in Manchester on 16 and 17 September, and concludes at London's Alexandra Palace on 22 September. 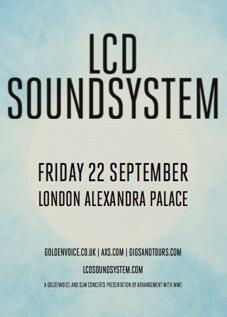 The Alexandra Palace gig marks LCD Soundsystem's first headline show in London after they group reformed in 2015, and follows numerous wildly successful festival appearances around the UK and abroad. Tickets go on sale this Wednesday (21.06.17) at Gigs And Tours, Goldenvoice and AXS.